!! !Please register in advance so we can make proper preparation.!!! Pratītyasamutpāda – A name given by the historical Buddha to the arising of samsaric phenomena, variously rendered into English as “dependent origination”, “conditional genesis”, “dependent co-arising”, “inter dependent arising”. “Commonly translated as dependent origination, or dependent arising, is a key principle in Buddhist teachings, which states that all dharmas (“phenomena”) arise in dependence upon other dharmas: “if this exists, that exists; if this ceases to exist, that also ceases to exist”. Kindly help forward this message to those who might be interested. Anattā/Selflessness: Beside the assembly of the 5 aggregates (Skandha) there is no independent self. On the these 5 aggregate (Skandha), self manifests temporarily due to grasping. Whatever is form is emptiness, whatever is emptiness is form. Garland of Views – teachings by Lama Rinchen 11-13 Jan 2019 บรรยายธรรมโดยลามะรินเชน 11-13ม.ค. Limited places available, first come first serve basis. Please register immediately. Please help share/forward to anyone you know that might be interested. The retreat on Introduction to Meditation and Compassion by Lama Rinchen Phuntsok (http://dongakcholing.org/LamaRinchen.html) retreat. What is meditation and how can it lead us to end suffering and end causes of suffering? What is compassion and why is it essential? These question will be addressed in great detail along with introduction to the actual practices of meditation and the cultivation of compassion. This program will start from preliminary with in-depth detail. All levels of practitioner are welcomed, from new-comer to advanced. Happy Guru Rinpoche Day! In today’s video, Phakchok Rinpoche introduces Raksha Tötreng, the manifestation of Guru Rinpoche who is known to protect against uncertain time of death. Related with this, Rinpoche explains the importance of wearing protection chakras and requesting prayers from authentic lamas and nuns. We are happy to announce that there are subtitles for this month’s message in Simplified Chinese, Traditional Chinese, French, German, Indonesian, Italian, Japanese, Nepali, Polish, Portuguese, Romanian, Russian, Spanish, Thai, Ukranian, and Vietnamese. Please click the settings wheel in the bottom right corner of the video to access these options. We are also interested in your feedback about what teachings you would like to hear in the Guru Rinpoche messages. Rinpoche has asked his sangha as well as all who are inspired to take part to accumulate 10,000,000 (ten million) recitations of the Six Vajra Verse supplication yearly.Over the last three months we have accumulated a total 650,394. To reach our target of 10,000,000 a year we need to as a group increase our effort more than four fold. Please help us to achieve this goal. Click here to read more about this supplication and contribute your accumulations. Sarva MangalamMay all be auspicious! Very few places available, please register immediately, first come first serve basis. 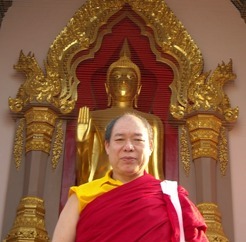 The retreat topic is Essential Advanced Dzogchen Ngondro of Dudjom Tersar with Lama Rinchen Phuntsok (http://dongakcholing.org/LamaRinchen.html) retreat. This program will start from preliminary up to advanced practices (Dzogchen level). For this, Hinayana, Mahayana and Vajrayana will be covered. All levels of practitioner are welcomed, from new-comers to advanced. Very few places left, please register immediately, first come first serve basis. This month’s video features Kalden Drendze, and is a continuation of the Twelve Manifestations of Guru Rinpoche series. Here, Phakchok Rinpoche shares a very concise method for gaining accomplishment in the practice through a simple visualization. Rinpoche has asked his sangha as well as all who are inspired to take part to accumulate 10,000,000 (ten million) recitations of the Six Vajra Verse supplication yearly. Over the last two months we have accumulated a total 437,529. To reach our target of 10,000,000 a year we need to as a group increase our effort four fold. Happy Guru Rinpoche Day! 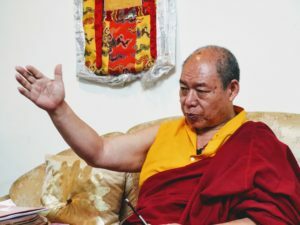 Here, Phakchok Rinpoche speaks on Guru Dorje Draktsal, and details the sources of our fears and how to tame them. It is with great joy, after three years of hard work, that we are announcing the completion of the Nepal volume in our forthcoming series of pilgrimage guides dedicated to Guru Rinpoche‘s life and deeds. To inaugurate this special event, we wish to invite you to join us this autumn as we follow in the footsteps of our precious Lotus-Born Guru, Padmasambhava, travelling to the holy sites of Nepal, where he taught, practiced and accomplished the Dharma. This, our first official Guru Rinpoche pilgrimage, will be taking place in the auspicious Tibetan Year of the Bird – the same year in which, generations ago, the precious Jarung Kashor, otherwise known as the Boudhanath Stupa, was completed and consecrated. Kyabgön Phakchok Rinpoche has asked his sangha as well as all who are inspired to take part to accumulate 10,000,000 (ten million) recitations of the Six Vajra Verse supplication yearly starting from this Guru Rinpoche Day. So far of you have accumulated 215,489 recitations of this prayer. To reach the target of 1,000,000 a year, we need to as a group increase our effort four fold! Please help to make this goal a reality. This blessed supplication was revealed as a treasure by the great treasure revealer Chokgyur Dechen Lingpa in the 19th century. The first three lines are supplications to three forms of Guru Rinpoche, the fourth line is requesting Guru Rinpoche to grant blessings, the fifth line is requesting that all levels of obstacles may be removed, and the sixth line is requesting that all wishes may be spontaneously accomplished. It is taught that there is no greater refuge in these times than Guru Padmasambhava. Make this supplication with a sense of weariness towards samsara, with love and compassion towards all sentient beings, and a heart full of genuine devotion. There is no doubt that the blessings will manifest in one’s mind stream when you supplicate in this way. You may recite this supplication during your daily practice sessions as well as while going about your daily activities. We have started a new counter which both tracks your personal contribution as well as the unified total. The page also has more information on the chant as well as links to teachings and commentaries on this profound supplication. Hello. Happy Guru Rinpoche Day. Today I want to talk about the manifestation of Guru Rinpoche in Tukdrub Barché Kunsel, called Dzutrül Duchen—the Great Powerful Magical Master, Guru Dzutrül Duchen. Sometimes we refer to him as Dorje Drolö. Guru Rinpoche revealed this manifestation especially to transform negative appearances, negative mind, and negative environment. What is negative environment? It means negative appearances that make our mind become negative… hatred, basically. Negative appearance brings hatred. So Guru Padmasambhava specially manifested as Dzutrül Duchen or Guru Dorje Drollo, taming or subduing or purifying all of that. In our life, what we really need is to have positive thinking. But sometimes we have this idea that positive thinking means to not have wrathfulness. When you need to say no, you cannot say no. Or when you need to point out some problematic things, you can’t because you are thinking positively. So it is very important to balance. You have a positive mind. You want to be perceiving through a positive way, but when you see a few people creating huge problems, you need to know how to resolve those problems. We want to see the negative thing and how to resolve it, or remove it, or subdue it, without giving up our positive mind. That is the practice of the great Guru Rinpoche’s Dorje Drolö. Guru Rinpoche himself said, there are going to be a few people, we call “damsi”—these are the troublemakers. Unnecessarily trouble-making. We need to know how to reduce them, or change them, or transform them, or remove them, or tame them. And, at the same time, keeping whatever possibility you can to have positive thinking. You need to know how to reduce these things while keeping positive perception. This is particular to the practice of the Great Guru Dorje Drollo. I really think it is very important in today’s practical world, in practical life. Happy Guru Rinpoche Day. Thank you very much. Be positive.